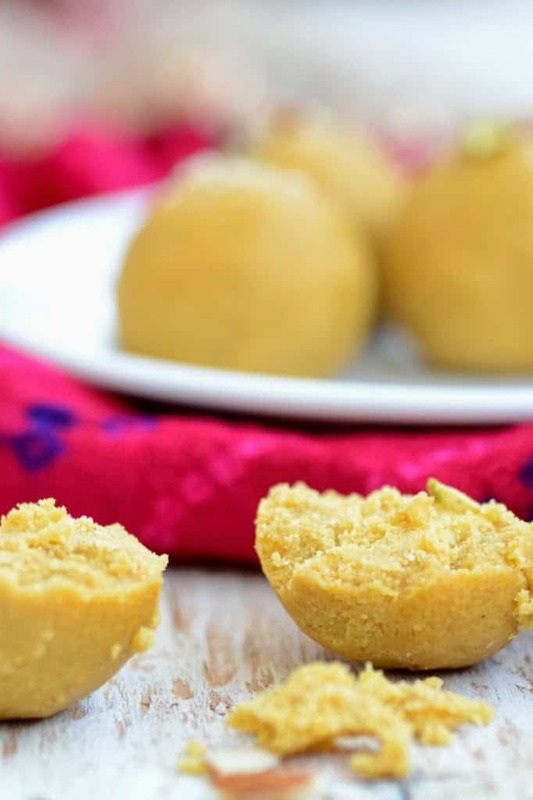 Besan ke Ladoo is a popular Indian sweet made of besan flour or chickpea flour. My mom makes delicious Besan Ke Ladoo and this was always a part of our childhood. This time, when she was visiting me, I learned to make these from her and noted down the ingredients. I made these today using her recipe and measurements and they turned out perfect, just like hers. 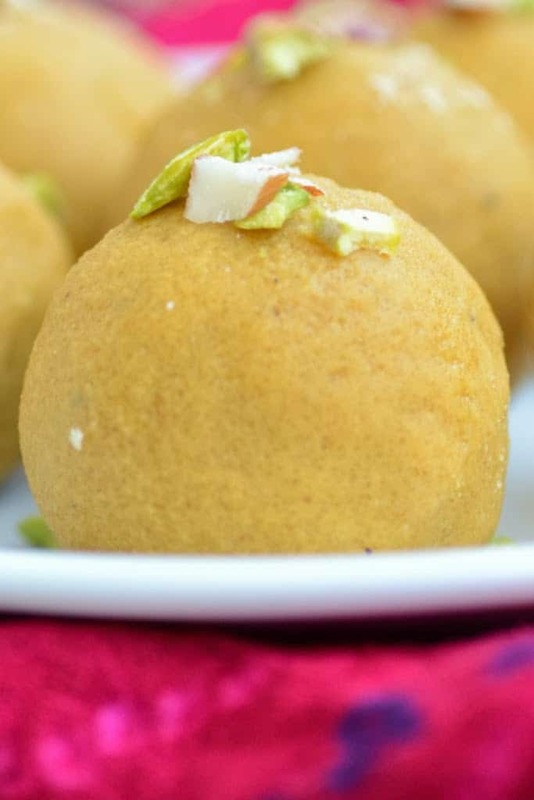 Besan Ke Ladoo is good for the stomach, nutritious and tastes well with dry fruits. 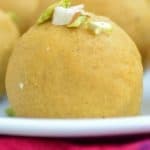 It is a popular sweet dish for Diwali, to serve relatives and friends.Other sweet dishes that can be made with besan include Besan Ka Halwa and Badami Besan Doodh. My son doesn’t like dry fruits in his ladoos and so I made them without adding any. But you can definitely add some almonds and pistachios in your ladoos and make them more delicious. 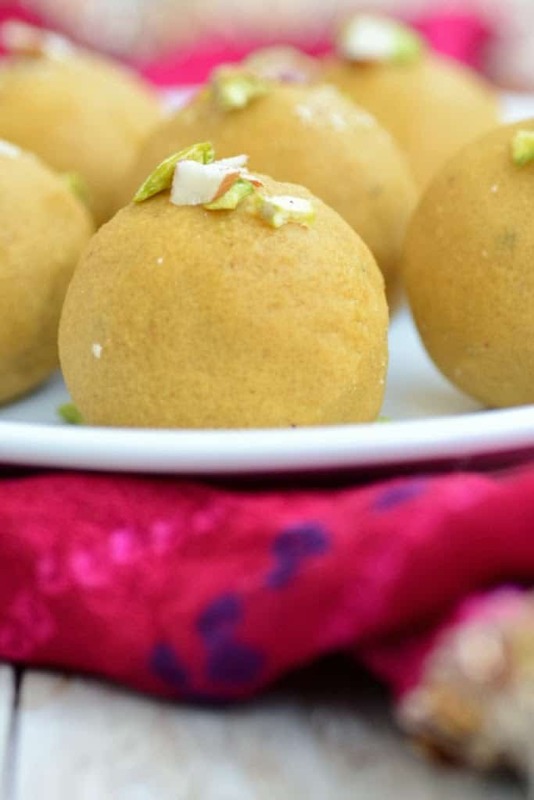 Present Besan Ke Ladoo to your family/friends during festivals or just for a quick nibble. Here is the recipe. Add besan and fry on low heat till slightly browned and a nice aroma starts coming. Splash a tablespoon of water in the pan. Lot of foam will form up in the pan. Keep cooking till the foam settles down. Add the powdered sugar and cardamom powder and mix well. Add the almonds and pistachios. Remove the pan from heat and cool for 10 minutes. Take a small amount of mixture in your hand and make small balls. Garnish with almond and pistachio slivers.